Over the last year, I’ve found myself becoming less and less of a makeup wearer. I’ll put on cosmetics maybe once a week. Even though it’s infrequent, I am an absolute obsessive about the quality of the cosmetics I do use. However, I don’t make my own makeup. Or, at least, I haven’t yet. It looks complicated and pretty expensive for most of the ingredients. So when Holly from the lovely (eco-conscious) company Nora Bloom sent me some loose mineral powder to try, needless to say, I was stoked. By stoked, I mean I called everybody I knew (who still actually answer my phone calls) and told them how great life was. See, I have a deep, abiding love for mineral foundation (but please read the bottom of this post for more thoughts about it). My skin tends to be on the oily side, and I’m not really a fan of the “sheen” look that so many liquid foundations offer. Light matte finish is my friend. But on the Nora Bloom website, she recommends using her Dandelion Face Cream in conjunction with the mineral powder to create more of a tinted moisturizer. And I loved that idea. But I didn’t have any of the cream. Crunchy Betty to the rescue! I cooked up a quick and easy recipe for daily moisturizer that you can use with or without the mineral makeup. Hooked. I am absolutely a new convert to this method. Best of all, everything that I’m putting on my skin is 100% natural. 100%! 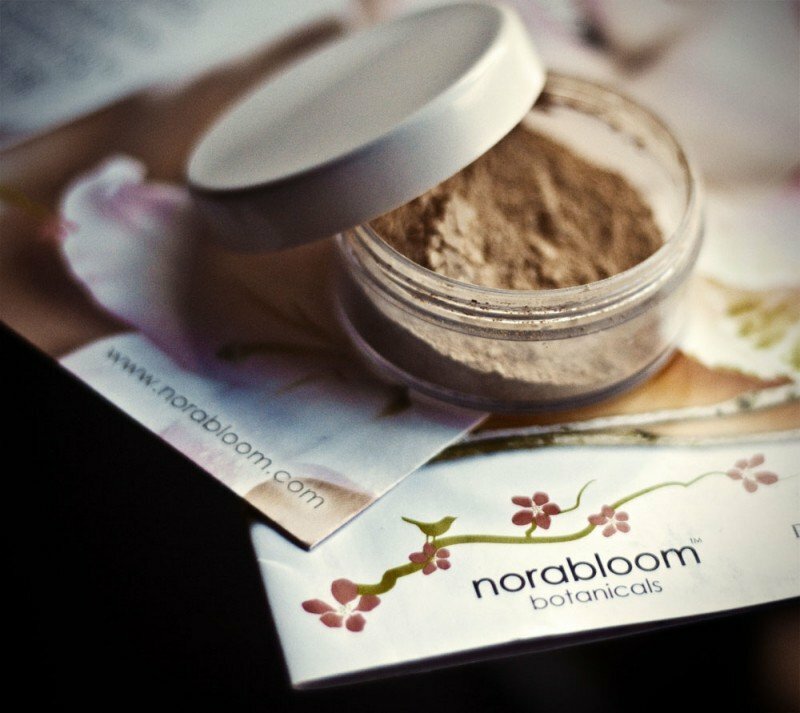 When you’re done here, be sure to hop on over to the Nora Bloom site and check out some of her paraben-free, pthalate-free, ultra-nourishing skincare items. The calendula cream, in particular, looks heavenly! Combine all ingredients in a small bottle and shake well. Should keep, unrefrigerated, for at least 6 months. Approximately 30 applications – depending on how much you use each time. That's my hand, by the way, with the "new" liquid foundation on it. 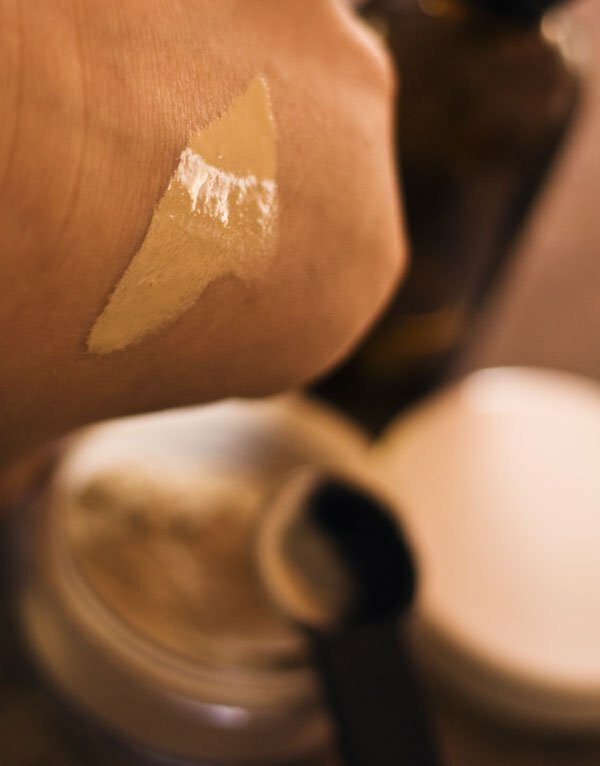 Put a scant 1/8 tsp of your loose mineral powder in the palm of your hand, and add the moisturizing oil until you reach your desired consistency (I found about 6 drops out of a dropper was perfect for a light to medium-coverage application). Rub the mixture around with the ring finger of your opposite hand until it’s blended well. Apply as you would any liquid foundation. There’s no reason why you can’t just use the moisturizer you have right now to create this effect. Please, though, be sure it’s all natural (and I mean do that by actually reading the ingredients). For me, this was the perfect coverage and it lasted (on my three trial days) at least six hours before I felt like I should apply powder. I did find, though, that at around hour 3 or 4, I started to get the “glow” look – and I didn’t mind it at all! It was actually really pretty and natural, and not at all oily-appearing. The oil moisturizer recipe is perfect for any skin type, though drier skins may need a little extra moisturizing. Try adding a few drops of jojoba oil to the mixture for that. After applying the oil/powder combination, I set it with a very, very light dusting of the powder itself. I think that’s what gave it extra staying power. The moisturizing oil can be used alone (without any makeup) as your morning moisturizer. Just be sure to apply to a clean face. Me and Nora Bloom Loose Mineral Powder - BFFs. 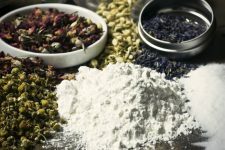 Earlier this year, Dr. Oz created quite a spectacle by declaring mineral powder makeup unsafe. The reason, he states, is because you can inhale it, and it can be an irritant to the lungs. 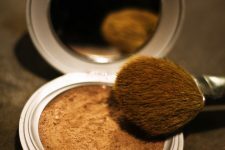 Even though he admitted that there were no scientific studies backing the claim that the tiny amounts of dust that MAY fly (by novice mineral powder users) could be harmful, he encouraged women everywhere to throw their mineral makeup out. Here are my thoughts on that: Mineral makeup powder (created by brands who are conscious of the quality and naturalness of their makeup) are 100% purely natural – no synthetics at all. This is already a huge step up from where makeup has been for decades. Secondly, if you make sure your mineral powder is not micronized (leading to nanoparticles), the possible dangers reduce substantially. The good news is, most conscious cosmetic companies will not micronize their mineral makeup. Lastly, for me personally, I use makeup so infrequently that I have a hard time worrying about the minuscule amounts of dust I may or may not be inhaling when I use mineral powders (that are non-micronized). The benefit to my skin is just too great. And while Crunchy Betty is, of course, dedicated to healthy, green, nontoxic, and conscious beauty and homemaking, I’m doing my best to avoid jumping on the fear-mongering bandwagon. There are ingredients I avoid like the plague (parabens, pthalates, petroleum, mineral oil, sodium lauryl sulfate, etc. ), but I research and use critical thinking before going nutso about it. I do, though, reserve the right to change my opinion, should other evidence present itself. What do YOU think about mineral makeup powder? And did you visit Nora Bloom? LOVELY, isn’t it? However… the moisturizer is right up my alley. I was looking at avocado oil the other day in the store and wondering what I could do with it. Duh, put it on my face of course. I doubt there’s much of a difference between cosmetic-grade and food-grade avocado oil, but I use the cosmetic grade (just because I got a really good deal on it last year – and it’s lasted forever). And you definitely have a face that works well without foundation. The smartest thing is to work with what you were given in the most natural way that makes YOU feel good. Clearly, you have that nailed. I don’t think I could ever go back. It has so much more staying power than regular foundation – and I’m kind of obsessive about whether or not my foundation is still there (which has led to far too much reapplying of powder in the past). Do you find that you have a hard time ordering “colored” makeup online? I don’t know how many times I’ve seen a lipstick I think I’m going to like, but I chicken out at the last minute, sure that the color on the screen is going to be nothing like it is in real life. That’s how I felt about it, too! When I watched the video of him talking about, he went CRAZY trying to stir up as much dust from it as he could. No self-respecting mineral makeup wearer would do anything even remotely like that. 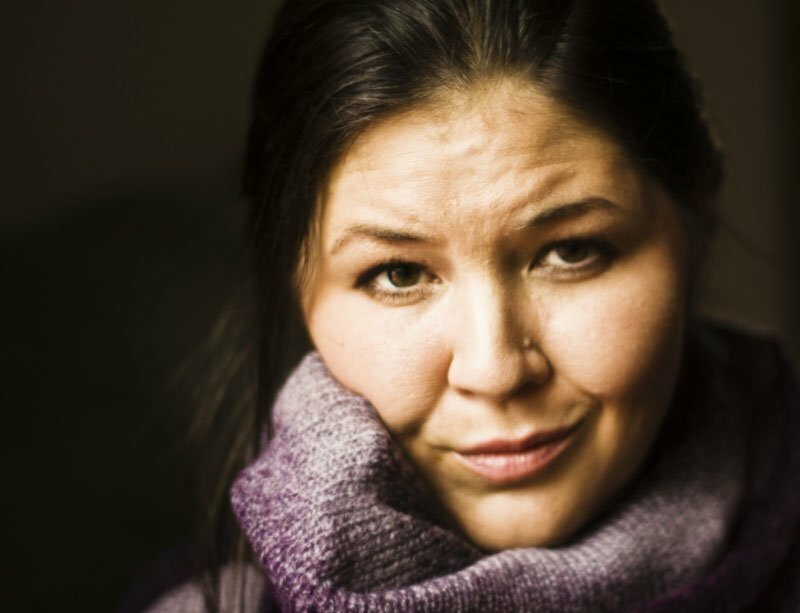 The stuff isn’t cheap, and we want it on our face, not in the air (or in our lungs). Okay, it’s almost 2am, so I’m bookmarking this. I wear nothing BUT mineral powder. Have for years. Sounds like my skin and your skin are buddies. I’ll be back when my brain is less tired. 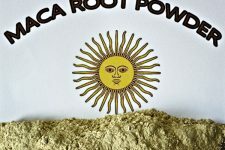 I been really curious about mineral powder make-up. I like that you said it can be mixed with moisturizer, I do that with my liquid foundation a lot. Will mineral powder make-up even out an uneven skin tone at all? I always just thought it gave skin a “glow” but didn’t really do the same thing as “regular” foundation. Can you enlighten me more? I love your typos. I think I’m going to spend the rest of the say saying “I been” in honor of it. Because it’s funny. And a little Kansasy. I need to honor my roots. Actually, I have pretty uneven skin tone – pretty red in places. It’s the reason why I’d say my only necessary makeup is foundation (and mineral powder is my fav). So yeah, it evens it out. And, of course, it depends on how much you put on. You kinda have to be careful with mineral makeup, though, ’cause it can get a little cakey. Except I having bad grammar today. Also mixing a mineral powder with moisturizer sounds like a fantastic idea. Should try that out next time I put makeup on (not that much of a makeup wearer either). Thanks! I’ll have to check into that more. Just like everything it seems like it’s so much easier to buy it than to make it yourself – but the truth is, it’s usually easier and more FUN to make it yourself. In the meantime, though, Imma loving the Nora Bloom stuff! Great tips here! As I have got older I must say I prefer tinted moisturizer to foundation, its less cakey and gives me a much more dewy complextion – it also doesn’t dry out my skin! so am a big fan! I love this tip that turns your powder into foundation, how clever! I am going to def try it out! im just wondering, is the carrot seeed oil necessary? as i cant seem to find it anywhere. I’ve just mixed my mineral powder foundation with straight sweet almond oil and it works PERFECTLY. The powder I use has a pretty strong matte finish, but that doesn’t agree so well with my skin. Having it mixed up with the oil makes it so much easier to apply, and it makes it look so much better! It’s so glowy and perfect-looking and awesome. I’ve used mineral makeup for years, and I love it! Just a little bit evens my skin tone and lasts all day. I have to say, I try to keep clouds of makeup to a minimum. Better on my face than on the vanity. i LOVE my mineral make up, i discovered it by accident several years ago and cant seem to bring myself to buy anything else (to be fair the tiny amout you need per application and the infrequency of my bothering with it it lasts forever – and since its so natural that fine, more reasons to love it!) i’ve kind of always mixed it with my moisturier (though never oil, must try that…) or at least put it on straight afterwards while my skins still a bit ‘damp’ where as with more commercial foundations you’re supposed to wait 10 minutes or so for it to sink in. i can’t see how you’d create clouds of powder from it and if dust like that is so bad should i stop cleanning the house as i’m sure that throws up more dust than i do with my make up!!! can I use olive oil for this recipe? I just don’t care that much 🙂 I still don’t know what toner is for…lol. As far as avoiding powders, it’s really easy to convert loose powder to pressed powder. Just add a little alcohol until you get a mud-like consistency, scoop into a container, press down with a cloth, and let dry. The alcohol evaporates overnight and you have a completely natural mineral makeup with much less dust. All mineral makeup products are not “100 purely natural” in fact ANYONE can put “natural” on a product as it means nothing. Most big box and prestige brand mineral cosmetics still rely on chemical preservatives and fillers. Read the boxes before you buy!